I had a few moments to play today...and wanted to try out Beate's triangle box...tutorial is here. It was pretty easy. Since I made a Halloween themed one, thought I would post it today. I think I may use this template for my Thanksgiving favors. I think they would be really pretty embossed. 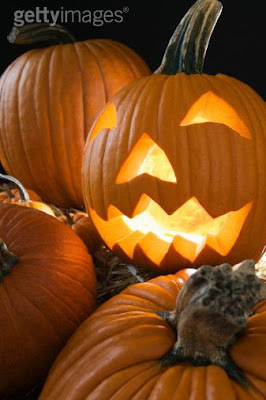 I hope you get lots of treats and no tricks! I picked up these cute containers at Michael's, stamped a quick tag (which you cannot see in the picture...*sorry*) and decided t o fill them with some Peanut Butter Blossoms (very yummy I might add). It is a good thing I worked out yesterday, because I ate a few Hershey Kisses while making them, lol! Ashley and Nate adopted a cute little kitten named Jacks...and I was so glad they stopped by to show him off to me...I love cats! Of course I had to take a picture of them...so CUTE! Have a super day! Thanks for stopping by!!! I hope you are having a wonderful day! I have several thank you cards to make...and so little time (to stamp that is). Last night I whipped this one up. 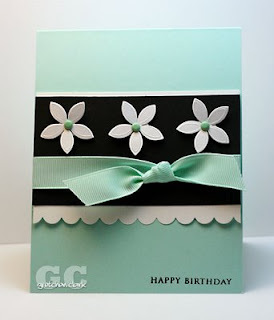 I pulled out some of my hoarded paper by My Mind's Eye, and some Papertrey ribbon and viola...an easy peasy card. I hope it fits in the envelope okay with this big bow on the front, lol! Enjoy your day! Thanks for stopping in! "If you love food and paper crafting, then this is the perfect recipe book for you – Paper Crafts Gourmet! " Don't you just love Papercrafts Magazine? This time they've come out with a new recipe book with over 50 original recipes plus over 110 projects including containers, tags, wraps and more to coordinate with those recipes!! For more info on how to purchase a copy of PC Gourmet click here. I just love books that have recipes and craft/packaging ideas all in one...and this one is definitely going on my wish list. 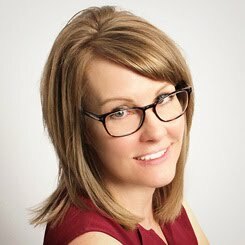 *leave a comment on Dawn's blog for a chance to win one free! Like this project and recipe designed by Alisa Bangerter...the recipe and instructions are included so you can make some too! I cannot wait to give these biscuits a try...don't they look like the ones from Red Lobster...yummy! "This is a perfect recipe to pull out if you are short on time because there is no rolling or cutting. The cheese and garlic add extra kick to a plain biscuit, and kids love them. They are the perfect accompaniment to serve with soups or stews, and are great served with a salad." Finished size: 3" x 4 1/2"
1 Make tag from cardstock. 2 Crumple tag and smooth out. Spray edges with color wash; let dry. Apply chalk. 3 Ink chipboard moon; let dry. Chalk edges and adhere. 4 Ink chipboard bat; let dry. Adhere with foam tape. 5Print sentiment on cardstock; trim and tear edges. Chalk edges and adhere with foam tape. Attach brads. Attach ribbon with brad. Well it is back to work after a busy weekend. I am happy to report that our garage is clean and organized again...ahhhh! So nice to drive into it and not feel stressed, lol! Saturday Mike and I went to Ashley and Nate's for a cookout...then to Costco to pick up some supplies for our Mexican themed church picnic on Sunday afternoon. We had a fun filled weekend, but I am tired today. Since we were on the go pretty much all weekend...I didn't get to stamp...*sad face*. 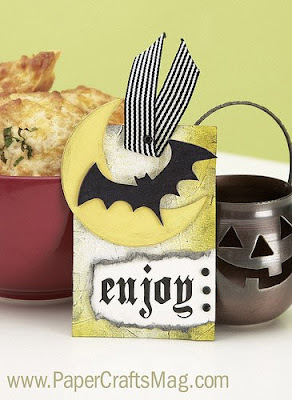 I did see a really cute idea that I want to "case" (copy and share everything) for Halloween...hopefully I will have a few moments in the stamp room before the 31st! 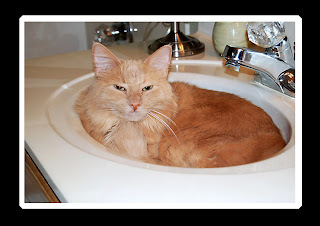 So since I didn't stamp...I wanted to share this funny picture of our cat, Peter (Crazy Pete). I was going up to get ready for bed one night last week, and was surprised by "this" when I turned the light on in the bathroom. I wanted to laugh out loud...but then thought...I need a picture of this, so I silently walked out to grab my camera...all I want to know is: What do these cats do when we are not around? (or maybe I am still stuck in wedding mode). I made this card yesterday for a friend of mine, who will be celebrating her birthday this week. Ashley had purchased these flowers from Michael's to sprinkle on the tables at the reception...they are in the wedding section, just in case you want to get some...She ended up having quite a few left, so of course I snatched them up for future card making. They are much prettier irl, kind of iridescent. I found some brads in my stash that are almost a perfect match to the Aqua Mist cardstock. I cannot believe that it is already Friday! Boy this week just flew right past me!! I didn't even make a dent in my to-do list...oh well, it was good to rest and take it easy. All that stuff will still be waiting for me. I am hoping to at least organize the garage today...Mike said he didn't want to pull everything out...so I am not sure if it will be done to my standards...but at this point I am not complaining. Things just seem to end up in the wrong place out there! We are also hoping to tackle some yard work too. We planted our winter grass last week (kind of funny, huh? ), but we like our grass green all year long...maybe since we are both originally from Connecticut and do NOT miss the snow! I hope you have a great weekend! Thanks for stopping by!! I am still a little under the weather...but hopefully today I will be back to myself. For some reason, I couldn't post this blurb with the little slide show I created (BELOW this post) of Ashley & Nate's wedding in Photobucket. You know how much I love, LOVE looking at pictures!! I hope you enjoy it! 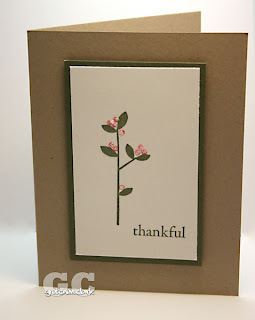 Here is a card I made last week (cased myself), when I was not feeling the stampin' mojo. Can you believe that I did not get a thing done yesterday on my first day off (I have the whole week...yippee!). I woke up and felt sorta sick, and the feeling lingered pretty much all day. Don't you hate when things work out like that? Maybe it was my body saying "take a break...will ya!" I hope to get in the stamp room today! I have a few birthday cards to make and finish up my cd cases. Have a great day! Thanks for visiting!!! I am so excited that I have this entire week off!!! I so need some recuperation from all the wedding stuff. I am hoping to get my creative juices flowing in my stamp room *smile* that is, after I finish all the stuff I have put on the back burner the last month, lol! This weekend I have been a wedding photo cd burning machine. I made cd's for our family, the wedding party, and some friends...and of course I had to come up with something to package them in, right? I searched the web for some sort of template for cd's and saw this one on youtube. It was pretty easy to make, but I had to modify it a bit, since I was using cardstock and it was a little thick. 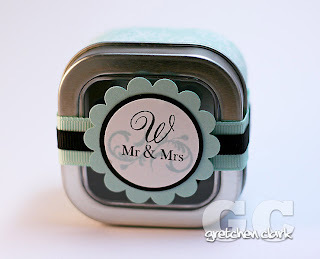 I used Ashley's wedding colors to tie it all together, and the favor it wedding stamp by Papertrey had the perfect sentiment *happy face* I cannot wait for everyone to get them in the mail this week!!!!! I am so glad that the weekend is finally here!!! I am so excited to have next week off...yippee! I am hoping to finally recoup from all the wedding stuff/and extra shift working. I just cannot seem to get caught up! 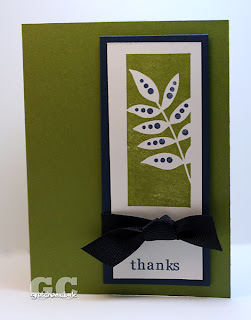 I made this card on Wednesday night...It is kinda simple, but after it came together, I kind of liked it;D I guess I was in the less is more/no stamping mojo mood, lol! I have been frequenting Facebook lately, do you have an account? I was so glad my brother joined a few days ago (finally Tim!). Now I am trying to build up my friend list...pathetic I know, lol! It is so neat to connect with people from high school and all my other endeavors! I hope you have an Awesome weekend! Thanks for visiting!!! Mike, Nate and I had a great time at the Creative Pastor's Conference on Tuesday...but, I was so tired when I got home...who knew learning was so exhausting, lol! Wow! This week and this month are flying by! If you didn't know...today is Bosses Day. 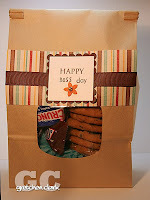 Last night I whipped up these bags to hold a gift card, cookies and candy for our AWESOME bosses. 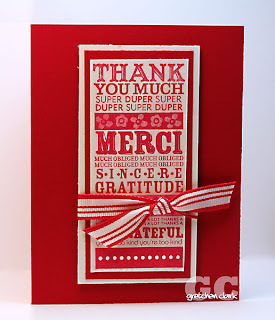 It took me quite a while to get back into the swing of stamping...the stampin' mojo was just not happening (I am still struggling, but hope once I do some more stamping it will come back!). Since we have three bosses in our office, I decided to make three different bags. 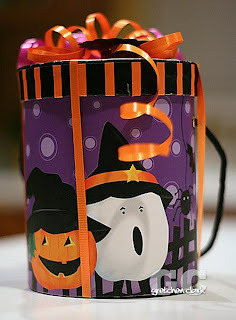 I used some of My Minds Eye patterned paper, and these treat bags from Papertrey (they are a great size). I also used my Paper Tray (PTI) stamp set and a retired alphabet stamp from SU! to stamp the tag. Then ran it through my cuttlebug with my Spellbinder dies. I am so glad that things are getting back to normal now that the wedding is behind us! Enjoy your day today!!! Thanks for stopping by!!!! 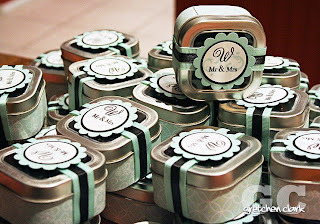 I used my Wedding Day stamp set by Papertrey Ink, as well as Aqua Mist patterned paper, ink and cardstock. 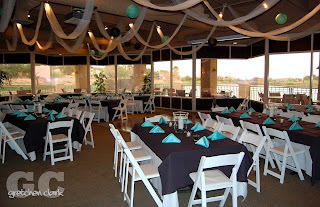 And I was happy to find out that the napkins from the reception were almost a perfect match to the Aqua Mist (they had to be special ordered...that was a relief!). Ashley and I cranked out about 100 of these babies...they went pretty fast once we got an assembly line going. We filled them with chocolate covered espresso beans...yum! Today I am off with my hubby and Nate to a Pastor's (and wives) Conference in Mesa, AZ. It will be nice to spend the day with Mike and Nate (Ashley is back to work). 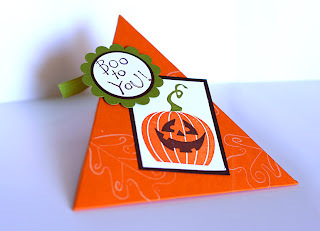 I have to get into the craft room before Thursday...it is Boss Day, so I have some cards and packaging to create...hope I can get my stamping mojo back...it has been too long! Ashley called on Sunday morning as they were leaving CA to come home(can you believe I hadn't talked to her all week?). We met them at their apartment to watch them open their wedding gifts (and put them away)! They had a lot of fun on their Mexican Rivera cruise an stayed ahead of the hurricane. I am so glad to have her back in town!!! I missed her! Since I was up to my elbows in pictures, I decided to update my October desktop (a little behind schedule, lol!). You can get this one here, all you have to do is drop and drag you pictures into it...easy peasy! Hope you have a spectacular day today! Since all our family left on Wednesday, I have been recuperating from all the wedding planning/set up/reception/dancing/visiting/family/tear-down/regular life, etc...I think I am almost caught up on my sleep...I have been surviving on major caffeine (LOVE Starbucks! ), lol! Thanks for visiting! Enjoy the weekend!!!! Just a quick post to let you know I am going to be taking a short break until all the wedding stuff is behind me. I have been running from the time I get up until I fall into bed at night...(this too shall pass), lol! Just wanted to post this picture of me and Ashely. She moved into her apartment on Tuesday night (all her friends are arriving this week), it is quite bittersweet! I am gonna miss this girl!!!!! I am so glad that she is only living 5 minutes away and that we work together!!! 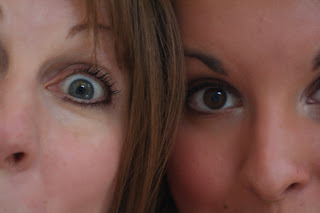 It is really weird to think that Mike and I are almost empty nester's (are we that old? )...that is, IF I let Josh move out, ha ha! 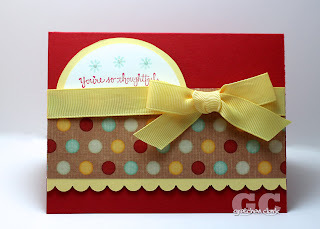 I am really looking forward to stamping again!!! So check back at the end of next week...hopefully I will have something new and exciting to post (of course I will have wedding pic's)!